Florals are a given for Spring but it's not often my favourite flowers, Hydrangeas make an appearance. 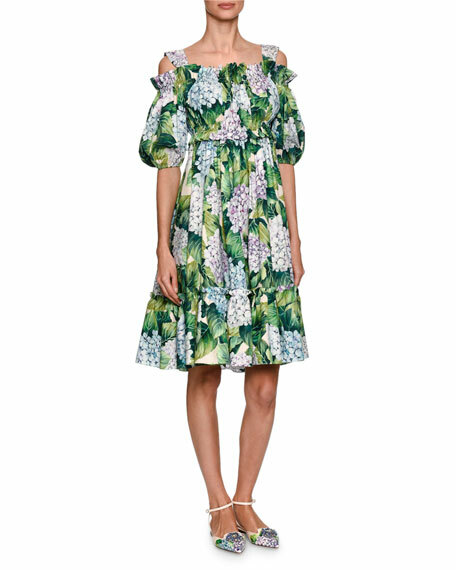 Seriously though, could you get a more Spring appropriate print? Dolce&Gabbana have done it again! This dress is insanely beautiful but I don't think over €3500 for a statement dress can ever really be justified. What can I tell you about Goodnight Macaroon? Well it's a US based website and has lately become one of my favorites. I discovered the site through a fellow blogger. Goodnight Macaroon specialise in very trend-driven pieces and this Look4Less is a great example of that. Clearly the print of this dress is inspired by the D&G original. Shop it Here. Over 3000 for a dress is ridiculous. You should keep an eye out on rubinoroo.com for the spring collection coming soon. Shipping outside of UK is a little steep, but worth it if you’re buying a few bits.